Lebenslauf August Brentano wurde am 1. August 1853 in Evansville Indiana geboren. 1877 übernahm er gemeinsam mit seinen Brüdern Arthur und Simon das Zeitungsgeschäft und die Buchhandlung ihres Onkels August Brentano in New York. Brentano's importierten als erste regelmäßig Zeitungen aus Europa in die USA. Die Buchhandlung, zunächst auf dem Broadway, dann auf der Fifth Avenue wurde die bedeutendste Buchhandlung der Stadt. Zur Firma gehörte auch ein Verlag, der unter anderem französische Literatur verlegte. Die Buchhandlung hatte bedeutende Filialen u.a. in Washington, San Francisco, London und Paris. Brentano's Buchhandlungen gingen 1985 in Besitz von Waldenbooks (heute Borders) über und sind in den USA inzwischen Geschichte. Die Buchhandlung in Paris existiert, mit anderen Eigentümern, auch 2017 noch. 1896 heirate August Brentano in New York Jennie Kaufmann. Die New York Herald-Tribune berichtete am 28. Oktober 1896 über die Feier. "The marriage of Miss Jennie Kaufmann, the eldest daughter of Gottlieb Kaufmann to August Brentano, was celebrated at 5:30 o'clock yesterday afternoon, at the home of the bride's father, No. 49 East Fifty-sixth-st. Only the immediate relatives and intimate friends of the family were present at the ceremony, which was performed by the Rev. Dr. Joseph Silverman, of the Temple Emanu-El. The bride wore a gown of white satin, trimmed with duchesse lace, and a tulle veil, which was fastened with a diamond star, a present from the bridegroom. Her sister, Miss Emma Kaufmann, was the maid of honor; Miss Madeline Bunzel, a niece of the bride, was the flower girl. The best man was Simon Loewenthal, a cousin of the bridegroom. The ushers were the bride's brothers, Alexander Kaufmann and Alphonse Kaufmann; Max G. Kaufmann and Max T. Kaufmann, cousins; Max Loewenthal and Emil Loewenthal. A reception and dinner followed the ceremony. Mr. and Mrs. Brentano, after their wedding trip, will make their home with the bride's father." Nur wenige Jahre nach der Hochzeit starb August Brentano am 10. Mai 1899 in New York. 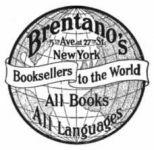 Biography “August Brentano of the old firm of Brentano’s, booksellers and stationers, died yesterday morning in the sanatorium of Dr. Edwin A. Goodridge, at Flushing, L. I. He had been an inmate of the sanatorium for six months, and was adjudged insane by Justice Truax and Sheriff’s jury in the Supreme Court on Jan. 20 last. Mr. Brentano’s illness followed serious business troubles of his firm, which reached a climax on Aug. 24 last, when a temporary receiver was appointed in a suit brought by Simon Brentano against his two brothers and co-partners for a dissolution of the firm. The firm was not insolvent, and the business has been continued. Simon and Arthur Brentano, brothers of the deceased, formed a company a few weeks ago. August Brentano was born in Evansville, Ind., on Aug. 1, 1853, and came to this city in 1873. He entered the employ of his uncle August, who had founded the house of Brentano’s 1852. The business has always been conducted on Union Square. 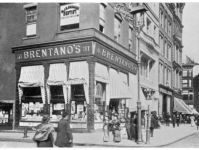 In 1877 Mr. Brentano and his two younger brothers, Simon and Arthur, bought out their uncle, who wished to retire, and subsequently branches were established in Paris, Washington, and Chicago. In 1887 they formed a corporation, with a capital of $ 300.000, which was afterward increased to $ 600.000, and the business was carried on by the corporation until 1894, when it was made a partnership.